Lurking under the surface, a monster moves in steady increments. The novice reptile keeper never sees it coming—making a string of simple mistakes that lead to a harsh consequence. This insidious disease manifests only after it is too late. Its name is Metabolic Bone Disease. “Meta-what?” you may ask. Well, most people refer to it as MBD. Technically, this is an umbrella term for a host of nutritional imbalances. Together, they cause a terrible transformation: bones will soften, bodies become thin, and eventually, paralysis sets in. The deterioration continues until their spine curves like a bridge, and the dragon dies mangled and miserable. A cruel death by MBD should be avoided at all costs. In this article, I explain how to detect, treat, and prevent Metabolic Bone Disease. What happens to Bearded Dragons left untreated? Use a multivitamin (Reptivite) once a week. If detected early, the worst case of MBD can be avoided. The idea is to stop it BEFORE the real damage is done. It’s vital that pet owners pay attention to their animal’s health, monitoring the physical and behavior clues that may prevent disaster. Never shrug off the unusual. Only a weird behaviour for a couple of seconds could be the beginning stages of much larger problems. Prevention and reversal are simple with this slow moving disease. Just watch for these symptoms: Is your Bearded Dragon acting weird? Lethargy, a slowed appetite and weakness are red flags for illness. MBD is high on the list of possibilities, but these symptoms could be linked to another condition entirely. Don’t make an assumption. Check thoroughly for other indicators of MBD. Tune your eyes to the subtle signs a sick reptile will display. A Bearded Dragon with Metabolic Bone Disease will experience muscle tremors and twitches, which are especially noticeable in the feet and toes. They walk shakily, with trouble controlling their hind legs. Track the pace your babies are growing at. The same nutritional deficiencies that cause MBD can stunt young lizards. Gently feel along your dragon’s bones, searching for hard knots under their scales. Before MBD is visible, you can catch it early through physical exams. Fragile bones fracture easily, and softened jaws may recede—these are definite signals of bone decay. Any reptile showing these symptoms should be treated for Metabolic Bone Disease immediately. Some pet owners choose to ignore signs of illness, leaving their unfortunate lizards to deteriorate in the crushing hands of disease. As the animal goes longer without help, its bones weaken and deform. Years of suffering can pass before the Bearded Dragon dies — its corpse will be totally different compared to its original form. MBD is an ugly and heartbreaking disease. Though completely preventable, it remains a common fate. Some people are blind to the value of reptile life. If you discover a lizard in need, I suggest attempting to rescue the animal or educate its owner. The leading cause of MBD is calcium deficiency. Absorption of calcium is affected by UVB, temperature, and the vitamins present in a reptile’s system. 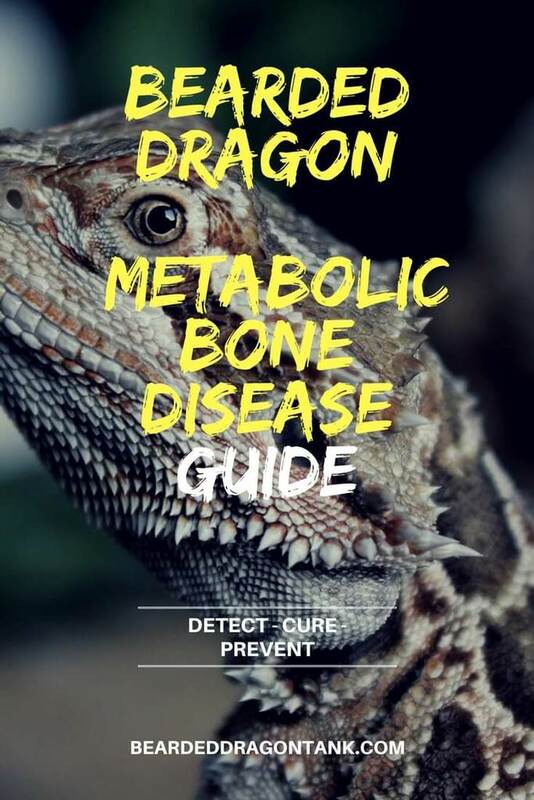 Keep this in mind while you consider treatment options for Metabolic Bone Disease in Bearded Dragons. Step one is to understand what caused the deficiency. Step two is to correct it. Early cases of MBD can be reversed simply by implementing new, healthy habits into your reptile routine. You should dust a high-quality Calcium supplement over your Bearded Dragon’s meals multiple times a week. The best supplement is ReptiCal with a 2-1 ratio of Calcium to Phosphorous. Vitamin D3 is necessary for absorption of Calcium, but too much can be harmful to your lizard. With proper lighting, Bearded Dragons should produce D3 themselves. If you choose to buy Calcium with D3, only use it a few times per month. Calcium without D3 should still be utilized frequently. Calcium will not be absorbed without a high-quality UVB bulb. Since most experts agree that coil bulbs don’t emit enough UVB, a Reptisun fluorescent tube (which must be replaced every 6 months) should be used. Keep in mind that placing the tank near a window won’t replace proper lighting, as UVB waves cannot pass through glass. Again, the ReptiSun UVB bulbs are one of the best UVB bulbs out there and this is a must have. Don´t waste your money on other bulbs with bad ratings when there is such a great bulb at a low price. Bearded Dragon’s require a basking spot of 95 to 100 degrees Fahrenheit. Without this, their food can’t be metabolized. Diets without nutritionally dense food can lead to MBD. Lettuce, which is mostly water, should never be fed as a staple. Avoid feeding spinach frequently, as the oxalates can bind to Calcium, making it useless to your beardy. Better options include turnip greens, collard greens, and vegetables like squash or green beans. Once the holes in your care regimen are corrected, a mild case of MBD will cease to develop. However, severe cases require intense attention. Seek professional veterinarian care as soon as possible. After reading this article, you have probably gathered a list of symptoms and mistakes to dodge. Remember to provide nutritious foods, use high-quality UVB bulbs, and supplement frequently. In an ideal situation, you can prevent this disease before it sets in. Most bone deformities are permanent. If you’ve identified Metabolic Bone Disease in your Bearded Dragon, take the initiative to correct your care before the disease becomes too serious. Either way, check up on your Bearded Dragon. You may have the chance to catch illnesses before they become real issues. Diseases are not invisible. An attentive reptile keeper will see it coming — correcting simple mistakes before they lead to a harsh consequence. Metabolic Bone Disease. It’s cruel and ugly, but now you understand what causes it, and that is all you need to prevent it. As you already know, death by MBD should be—and can be—avoided at all costs.